I do love a good pie, especially when I can bake it myself. Over the years I have slowly worked on making more an more pies and think I have finally made my favorite version of the sweet potato pie. This recipe has been a couple years in the making as I was trying to perfect the right spices, the right cookie for the crust and the right balance of ingredients. My most recent attempt, I received inspiration from Sally’s Baking Addiction. So whats the difference between sweet potato pie and pumpkin pie? In my mind quite a bit. Sweet potato is a little thicker, has a richer flavor, and really adapts to the spices differently. Sweet potatoes have their own flavor – one that is delicious without adding anything so I really wanted to make sure to highlight this and if anything just make it richer. I think with this pie I achieved that, there is a depth a flavor that is just so lovely and the extra kick from the Ginger Zinger crust is perfection. This pie is perfect for the holidays, but if you ever want to make an easy pie to eat at anytime- this is it. Simple, delicious with a kick of flavor! Crust | Put cookies in a food processor or blender until ground well, mix with melted butter and brown sugar. Press into a 9 inch pie pan and bake at 350 for 12 minutes. Remove and let cool. *Before mixing in the cornstarch to the pie, dissolve it in some a little cold water first then pour that into mix. 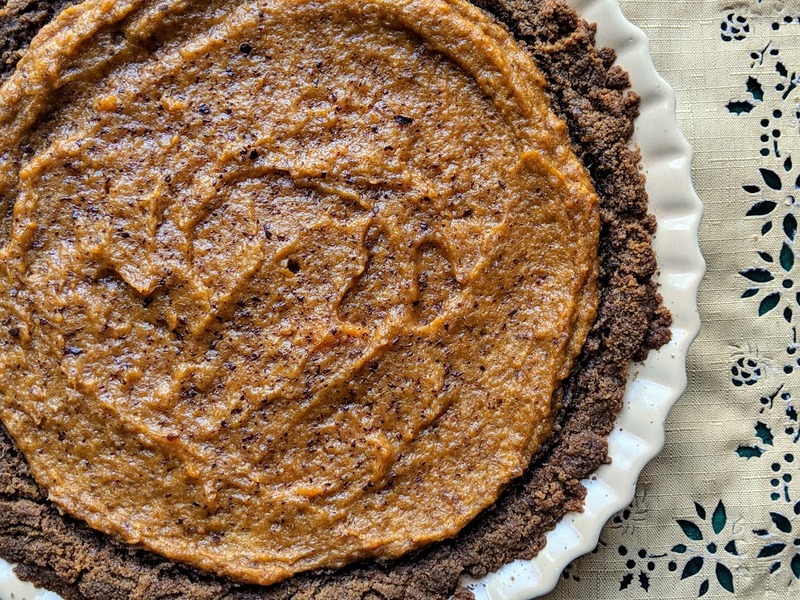 This sweet potato pie does not have the most perfect crust- its hand pressed so its going to be different every time you make it. But its literally one of my favorites because these cookies that Tates Bake Shop makes, the Gluten Free Ginger Zingers. They are so rich and make for the perfect crust. Fresh out of the oven – so creamy! I would eat this whole pie if I could- so delicious! I hope you all enjoy this pie, my family and I sure did!